BOOKTRYST: "Read, And Be Wise - Come, Read and Learn"
"Read, And Be Wise - Come, Read and Learn"
A scarce, early American abecedaire (ABC book) in battledore format has come into the marketplace. The Uncle's Present, A New Battledore, featuring "Cries" - street vendors who verbally announced their wares for sale - was issued out of Philadelphia in 1810. With cover woodcuts attributed to W. Mason and A. Anderson, it heralds "Read, and Be Wise" along the top cover's upper margin, and "Come, read and learn" along its flap. Within, twenty-four letters of the alphabet are illustrated with charming woodcuts depicting English Criers, including: a bookseller of almanacks, a broomseller, milkmaid, chicken-seller, a print (image) seller, lobster-seller, etc. 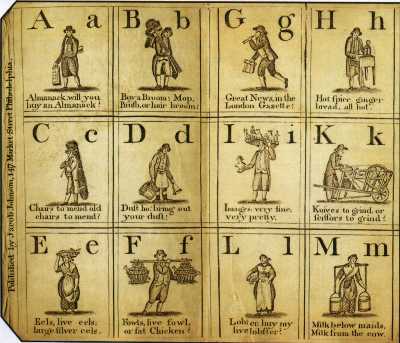 "The Cries illustrating the alphabet are a very pretty set, and are probably an early set of Newcastle or York Cries by [Thomas] Bewick...The letteres J and U are omitted to have 24 letters in 24 compartments" (Rosenbach). 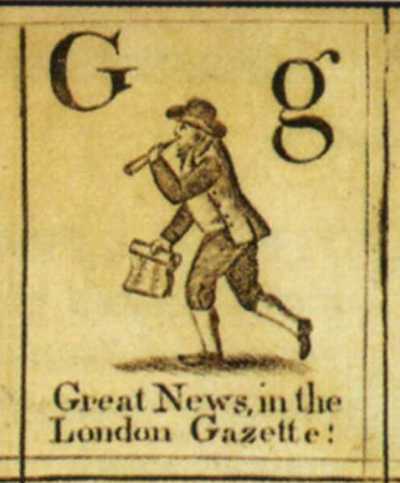 Unusual for battledores, an extra leaf is present featuring each woodcut for all the letters. Battledores were popular reading aids for children in mid- to late eighteenth century grammar schools. 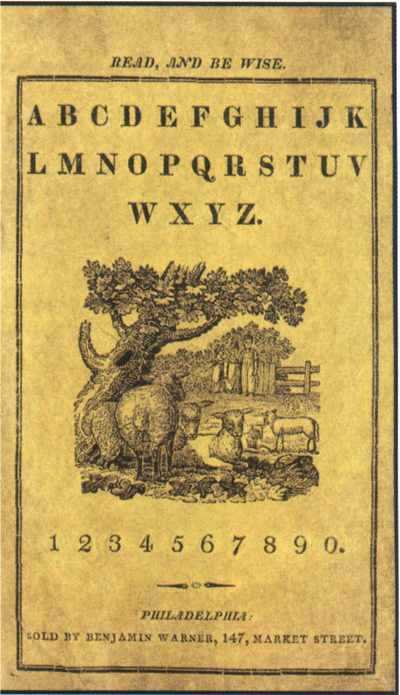 With their emphasis on learning the alphabet in an entertaining and illustrated format, their popularity with children was enhanced by the form's secondary purpose: outside of the classroom the stiffcard booklet was used as a paddle to play an early version of badminton, battledore and shuttlecock. The Uncle's Present is scarce, with OCLC noting only five copies in institutional collections worldwide. A facsimile was reprinted in 1964. [BATTLEDORE]. The Uncle's Present. A New Battledore. Philadelphia: Published by Jacob Johnson, Sold by Benjamin Warner, n.d. [c. 1810]. First edition. Octavo (6 1/2 x 3 3/4 inches). Four leaves. Twenty-four woodcuts in twenty-four compartments. Brown pictorial stiffcard wrappers. Images courtesy of Aleph-Bet Books, with our thanks. Louisa May Alcott On "The Girl Question," Etc.